Discovery Channel's Shark Week is coming up in less than a month! We've never watched the shark shows, but the kids are still fascinated with the sharp-toothed sea monsters. I wanted our upcoming "Everything is Awesome" Lego road trip to be a shark-theme, but I was out-voted. Maybe for our next beach trip (and when the kids are a bit older). 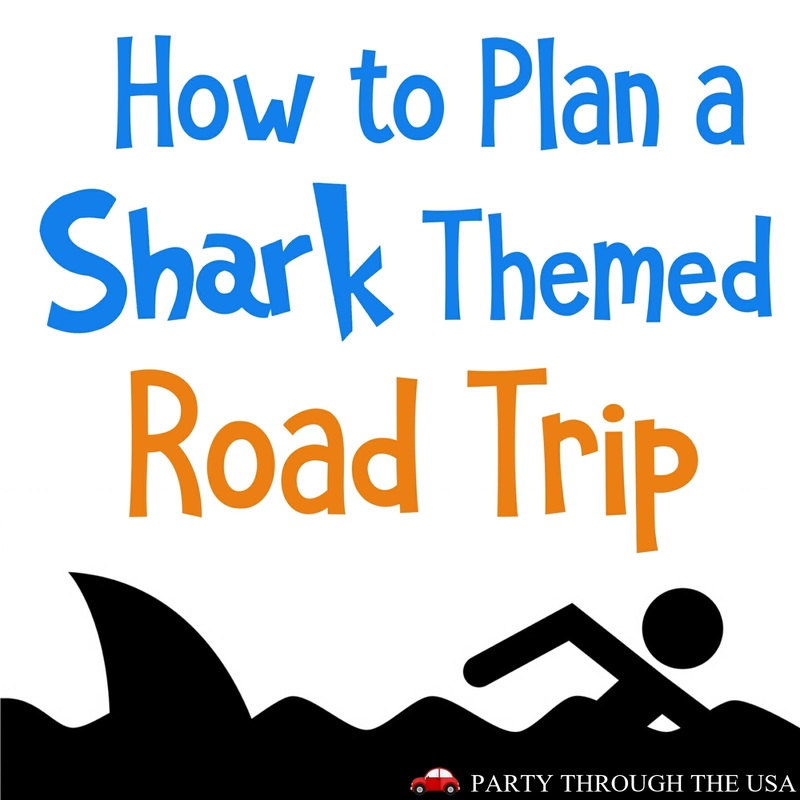 I made this theme road trip planner for myself, and decided to share it with all of you! A huge part of the road trip is feeding everyone. If you're car is full of a bunch of hungry sharks, you'll want to have lots of fun things for them to sink their teeth into. What else could you add to this list? An easy way to maintain your theme no matter what you're eating is with themed plates. This party pack is really fun and the shark isn't too scary. I like how these lollipops could be displayed as either a shark fin or a face. We brought these on our Pirates Road Trip. They were very fun way to express our theme. A classic shark treat. Put them in a blue jello cup for a shark-y treat. Sticking these in cheese or fruits to encourage eating of such foods. Shark ice or homemade candy. We love the CamelBak water bottles. This rock candy looked too cool not to include it. Next to food, keeping the kids entertained is the most important thing. When kids get bored, bad things happen. 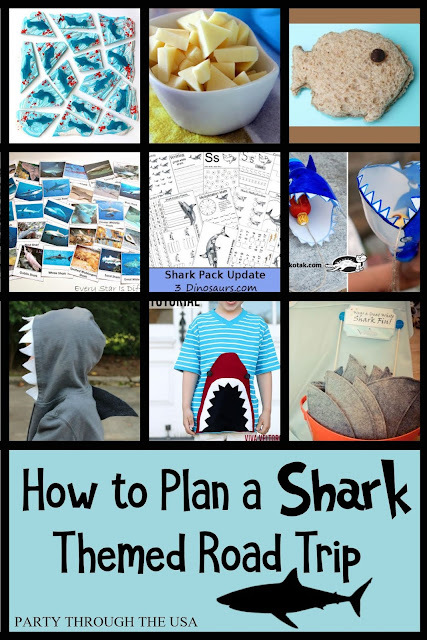 Keep the sharks from attacking with these non-electronic ideas! My kids love these plastic animals. They would absolutely love if I bought all the types of sharks. Legos are just the right size for taking on the road. This set is so fun with the shark and surfers. 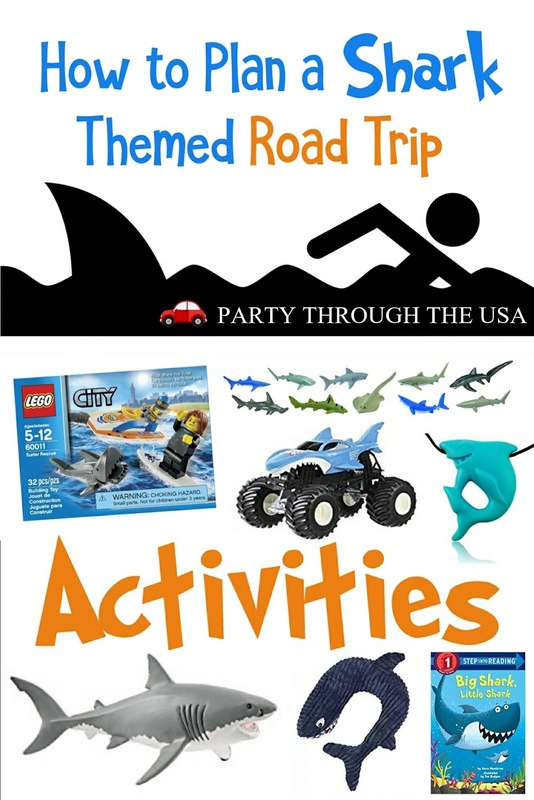 The 1-2 inch sharks in a toob are very fun in sensory bins and can be used for learning activities as well. They're a good size for the car and can fit in an Easter Egg. My boys love monster trucks! They would absolutely love this truck! Children with sensory needs to chew will love this shark necklace. Books are always a good thing to bring on road trips. Grab some truck-themed books and spread around the joy. A pillow is so fun it was listed as a toy! 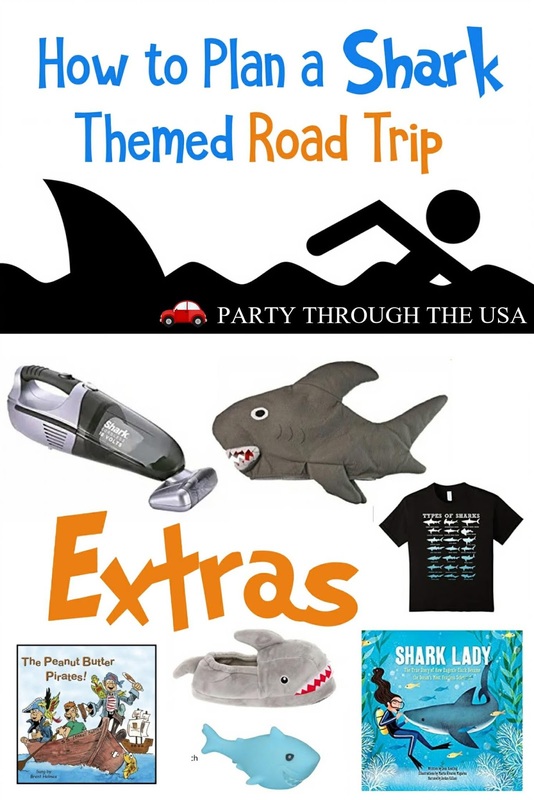 It's the extra things, like music, audiobooks, and costumes that make the themed road trip so much fun. A bunch of shark species all on one shirt- who wouldn't love that? This is our magic music for times when we need the kids to be calm or even to sleep. The lyrics are interesting and funny, but the tunes are easy on adult ears. Audiobooks are great for the car. The one tells about a female scientist, one of the first to see sharks as more than mindless killing machines. Announce to the world that you're going on a shark trip with these hats. Messy kids mean a messy car. Clean it up with this battery powered vacuum. 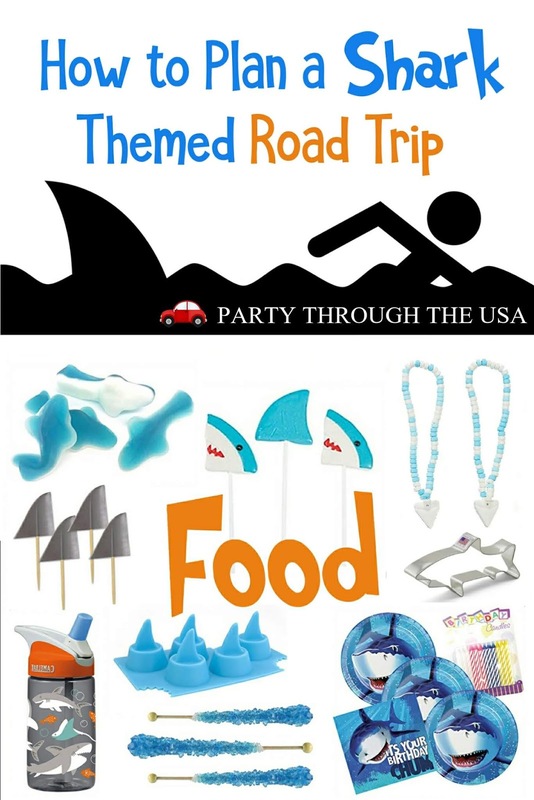 String these shark lights throughout the car or your hotel room. Comfort is as comfort does so wear comfortable shoes. Super cute idea! 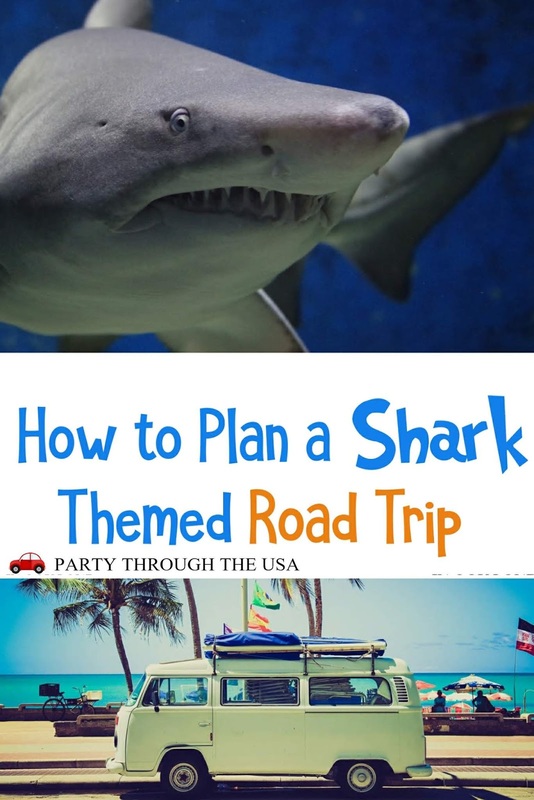 I've never done a themed road trip before but might just have to try this out for our vacation coming in a few weeks!